ABI SOLiD EZ Bead System Automated PCR Amplifier Enricher Genetic Sequencing . New Life Scientific, Inc. 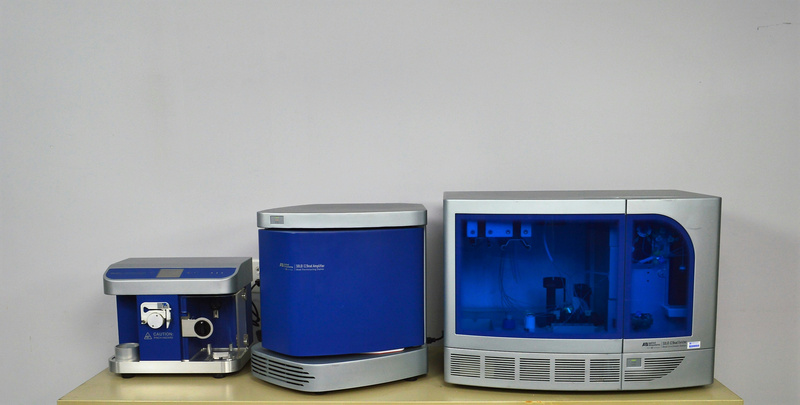 The Applied Biosystems automated genetic sequencing SOLiD system includes the EZ Bead emulsifier, amplifier, and enricher. The emulsifer performs bead sample preparation combining and aqueous and oil phase, the amplifier performs emulsion PCR for a high bead yield, and the enricher washes the templated beads (sorting the rest out). This system is for research use only. This system is in excellent cosmetic condition and includes all power cords required. The technicians have evaluated the instruments for mechanical and cosmetic damages, noting none. The instruments are clean inside and out, appearing to have minor signs of wear common with age and use. New Life Scientific technicians physically evaluated the instruments and tested them using the resources available. The bead enricher and amplifier (thermalcycling unit). The emulsifier spins, the peristaltic pump rotates, and all buttons were tested for responsiveness. Unfortunately, the software was not acquired with this instrument and NLS cannot acquire it for the customer. If the user is interested in software, Applied Biosystems insists a field engineer is sent out to evaluate the instrument and record the change of ownership with ABI; please contact the manufacturer for pricing.